One of the significant problems faced by organizations and stores of all kinds and sizes is business fraud. While fraud comes in many forms, it can be majorly categorized into asset misappropriation, financial statement fraud, and corruption. Most of these fraud categories are internal. According to the 2014 Report to the Nation on Occupational Fraud and Abuse, a typical organization loses 5% of its annual revenues to fraud, which is quite a significant amount to any company. The Association of Certified Fraud Examiners further estimates that most of these losses are due to employee theft. Prevention of fraud is more fruitful than recovering from losses after a scam. Therefore, it is advisable for all business owners to have these five precautionary measures in place to prevent fraud in their companies. Having a positive and constructive work environment prevents internal fraud and theft. Your organization’s work environment must encourage employees to adhere to the pre-established policies and procedures wholeheartedly. Only in a comfortable and constructive workplace, employees act in the best interests of the organization. An excellent way to prevent fraud in any organization is to have an open-door policy because it encourages open communication between employees and the management. Furthermore, the policies and procedures of the company should be unbiased and fair. In simple terms, even the owners and senior managers of the organization should be held accountable for their actions, regardless of their position. Hiring honest employees is one of the core goals of every business. However, it’s easier said than done. Sincere employees cooperate better with companies’ policies, and they help in maintaining a positive work environment. Therefore, while hiring employees, one must do a complete pre-employment background check and speak to their previous employers to do a character check. An effective pre-employment check will include the concerned person’s criminal history, civil history, verification of his/her educational degrees, conduct certificate verification from the previous employers, colleges, schools, etc. Furthermore, it is astute to check further details like length of past employments, reasons for leaving, etc. to get a clear idea about the employee before hiring. To safeguard companies’ assets internal controls are needed. These measures ensure the effectiveness of a firm’s operations and integrity of its accounting records. If you do not have internal control policies in your organization already, you need to institute them immediately. If your organization has internal control policies in place, then you must see if those policies and procedures concentrate on the following points. Employee duties should be segregated: In any business transaction, no single employee should be involved in transaction recording as well as transaction processing. Employing such a procedure will reduce the risk of fraud occurrence as this method of internal control can reveal any discrepancies. Employ access controls: To safeguard crucial data and assets, as a business owner, you must restrict access to financial assets and information only to authorized employees. Document every business transaction: The internal control policies must allow documentation of all financial transactions, including how they are initiated, reviewed, authorized, and recorded. Once you have hired sincere employees and have internal control policies in place, you need to deploy methods to monitor your employees regularly to see how well they cooperate to the various policies and procedures of the organization. Besides, it is also essential to inform your employees about organizations’ internal control policies and procedures, especially the ones that are related to fraud prevention. This information must be communicated verbally as well as in written form, and an acknowledgment for the same from each employee should be collected. Another productive approach to fraud prevention is to provide annual training to employees on various topics related to fraud prevention and detection. This training will not only help employees to understand the various frauds that can happen in an organization, but it will also make your employees stand up against a deceit or scam when it happens in their presence. As a business owner, you can also set up an anonymous reporting system in your organization, where one can report any violations of policies and procedures that they encounter. Cash transactions are more prone to fraud and theft than digital transactions. More than often, internal theft is an opportunity misused than done with malicious intent. Moreover, in retail businesses, employee theft is now a growing concern. Usage of cash makes it difficult to monitor internal theft. Replacing traditional cash-based point of sale with mobile point of sale (mPOS) not only restricts internal theft and fraud, but it will also monitor employees’ behavior and activities in depth. Such mPOS applications can be used to collect money even at your client’s place and not just at your store. 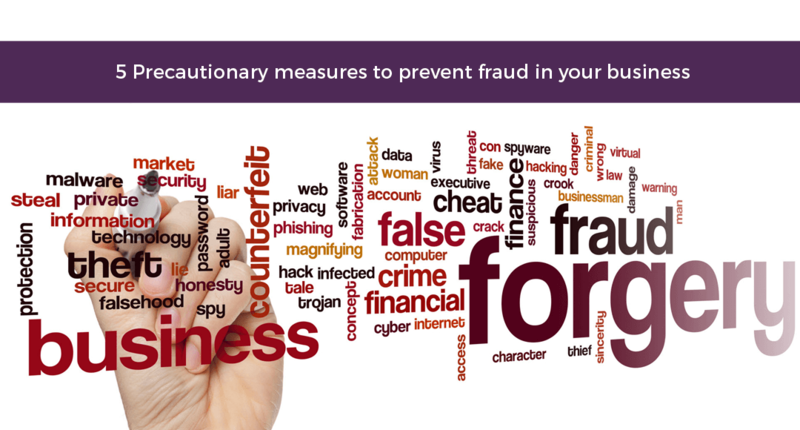 These are some of the precautionary measures that will help you prevent occupational frauds in your business. By implementing these actions, you not only prevent fraud and theft in your business, but you can also minimize internal losses. At last! Something clear I can unesddtanr. Thanks!